It came in a paper box that is shaped exactly like the Lipstick Bar itself, secured with bubble wrap inside. It is a simple yet clever design. Four rows with six slots placed together like a clear staircase. The rows are elevated gradually to the back so items easily show even from the front view. 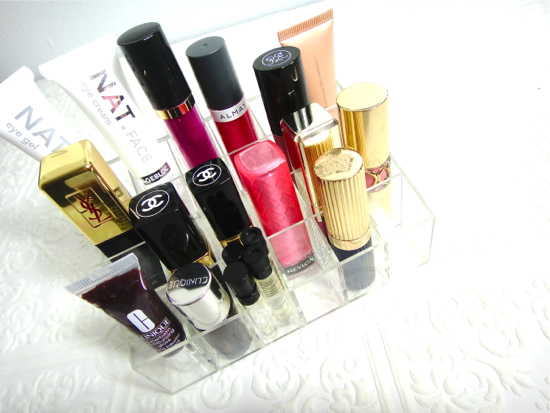 It is mainly designed to fit lipsticks as the size of the slots and the name - Lipstick Bar suggest, but I find it even more useful to store samples and tubes that are not freestanding. As you see in the stock photo, you can also put a lipstick in upside down so the labeled side shows for easy pickup. You cannot really do this with lipsticks with round tops (for example, MAC) if you're not equipped with an organizer like Lipstick Bar. VeryHoney offers hand selected fashion items with youthful edge and ships free on orders over $39. However, a free shipping code FRIENDSVH was kindly included in the package. VeryHoney also offers 10% off on any order including the Lipstick Bar with LENA10. How do you store your lipsticks and samples? 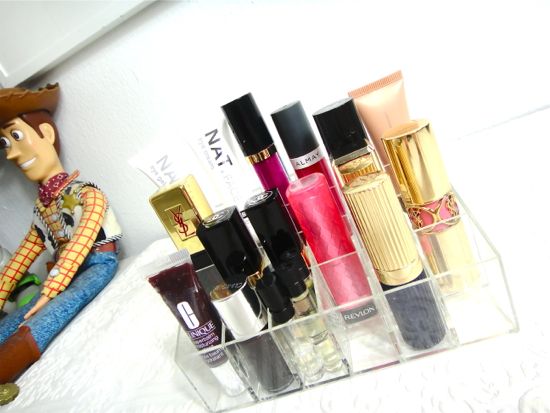 Do we have too many makeup items or all we need is just a clever storage system? Featured product was provided by VeryHoney.com for editorial consideration.